Is everyone still loving all the new releases from CHA? I am feeling a little over whelmed and grateful that I have a few weeks to make some choices about what to get 'right now' and what will have to wait until later. Since I started crafting again I don't recall there ever being so very many fabulous products releasing at the same time. But I digress, my fabulously brilliant niece is in theater at her high school and she has been practicing and preparing for the production of Footloose. I am excited and anxious for her and I know she will be fantastic. She is one of the most amazing, smart and talented young woman. One of the scenes in the play is the prom. She asked that I make her a corsage. Of course I said yes and am honored that she asked me. After I said, I panicked - what was I thinking! I have never done anything like this and had no clue where to start. So of course, I hunted and stalked everyone's blog until I found what I thought would work for her and something I could handle making. I found inspiration through Aphra's blog at this POST. She is super talented and crafty and I love reading her blog. Supplies: Cricut Cartridge Flower Shoppe, tulle, petaloo fabric flowers, and prima feather flower-french roast. Please let me know what you think or improvements. After I made the flower, I realized I didn't know how or what to attach it to. So I used a little felt and elastic strap that I got with ribbon scraps from Hobby Lobby, with a button closure. Have you lost your creative mojo? Need a little help or quick jump start? Then head over to Twisted Sketches for inspiration with little twist and try out today's sketch! I created the card below using the Twisted Card Sketch #91 the twist is "Old". The paper used for the card is from Glitz Designs - Vintage Blue collection, inked with Tim Holtz vintage photo distress ink. The image is actually a tag I received in a tag swap last year from Jude Young., I just added a little color to her with my copics. Next, I found the sentiment online and printed on the Glitz Design paper and used a corner punch from the Paper Studio. The flower is prima spritzed with Lindys Stamp Gang - Frosted Forget-Me-Not and added broken china stickles to the flower and chipboard piece. I hope you enjoy you visit, have a wonderful weekend. In case you don't know CHA Winter is right around the corner and let me just say - WOW! 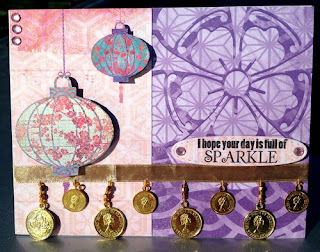 and Graphic 45 - new staples and Olde Curiosity Shoppe, oh and also Christy Tomlinson has a few stamps that may find their way to my studio. From what I have seen so far, it is going to be tough to limit my selections of new products to add to my inventory. On top of all the new products, I am trying to expand my inventory with My Creative Time's amazing stamps and Peachy Keen Stamps too. Goodness so many wonderful and amazingly talented people in the scrappy world. Bitten by the Bug 2 dimensional flower challenge. I cut the ladybug from Cricut Cartridge Create a Critter using Peachy Keen Stamps PKSC-01 for her beautiful face. 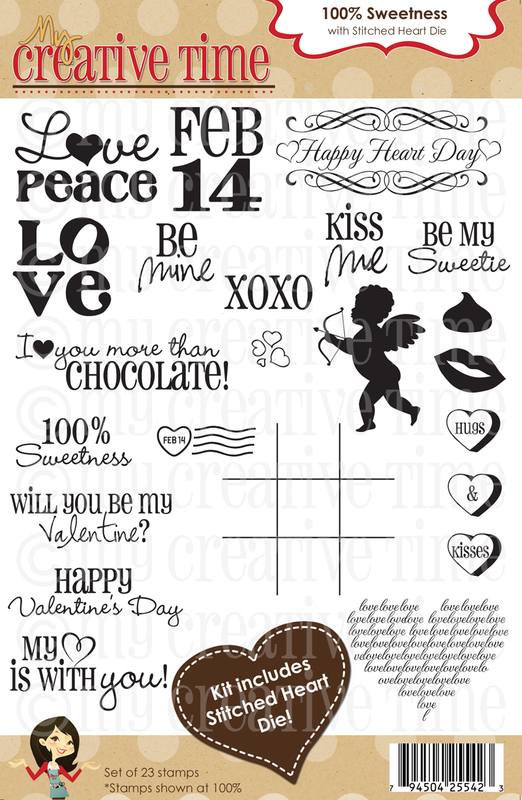 Using Cricut Cartridge Flower Shoppe, I cut from page 14 heart layers for the dimensional flower and the sentiment and heart cut came from My Creative Time 100% Sweetness stamp set. Anything exciting happen? Not much here, we started house shopping yesterday but no luck with what we are looking for. I made this card for my niece who turned 15 on the seventeenth of January. She is one amazing young woman. For the front I used My Creative Time's 'Keepin' It Classy' and 'Cherish This Moment'. All paper is from Die Cut With A View - La Creme Matstack. Other supplies used: SMASH tape, Martha Stewart Scalloped 3-Dot Punch, and TPC Studio Stamp inside. Thank you stopping by, have a wonderful day. WOW time flies when you're super busy. Didn't realize it had been so long since I posted. My son was sick (again) this time with a cold and also my younger sister is recently engaged so I spent time with her planning. We are super excited for her and soon to be husband. Congratulations! I made this valentine card using Peachy Keen Stamps PKSC-01 set and one of Emma's @ My Creative Time, stamp set 'You Had Me At Chocolate'. The paper is from DCWV Sweet stack and Love & Marriage Stack. and the floral band punch is Martha Stewart. Today marks the first day of my new design team duties for Twisted Cards. I have played along and have loved all the stetches from the past and I was/am thrilled to be apart of this wonderful team of ladies. The rules of play are: "Every Wednesday we will be providing a sketch for you to use on layouts and on Saturdays there is one for cards and with each sketch we add a twist to give your something to help inspire you to create." To see more about Twisted Cards or Sketches, you can find them here. Twisted Sketch #89, this weeks twist is "SPARKLE" any how any way! 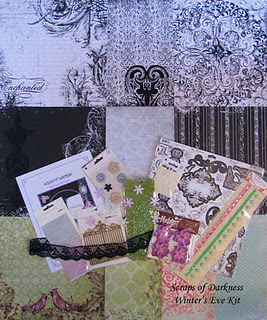 Supplies: Scraps of Darkness Marrakesh Express Kit (July 2011); sentiment from Crafty Sprouts and stitched oval die from My Creative Time. Now go to Twisted Sketches and check out the inspiration from the rest of the team. I don't know about you, but I am so glad today is Friday! Work has been crazy busy (I work at a University) getting ready for classes to start on Tuesday and for the arrival of all the students moving into dorms. I have been giving myself pep talks and rallying myself for another semester of work and for another semester of writing papers, note taking and exams (I am also a college student). So who better to help cheer you on than a little cheerleader. She is from Cricut Cartridge Lite Recess cut at 4". She is too cute and her beautiful face is Peachy Keen Stamps PK-490 Everyday Character Face. Her twine pom poms came from Pink By Design. And the fabulous sentiment is from My Creative Time - Just A Little Note (love Emma's stamps). I'm also going to submit this at My Creative Time - Through Back Thursday Challenge. I am starting to work on valentine cards for my kids classmates. My daughter is wanting all hers to be different and unique, but thank goodness my son doesn't care. He's cares more about the food we are taking - cookies. Today's card is for one of my daughter's closest friends. Can you guess which team she is on?? The image of Edward is from Pixie Dust Studio, he is colored with Bic Mark It and stickles. The paper is DCWV Love & Wedding and the sentiment is from Crafty Sprouts inked with colorbox pigment white. Today's post will be quick, I just wanted to share a card I made with the Peachy Keen Stamp kit of the month. I am so excited about today's card and the kit club, I have wanting some Peachy Keen Stamps for awhile. Click HERE for more information about Peachy Keen Stamps and the new stamp kit of the month club. You will love them! Is she not the cutest ever! 2. Cloud - Imaginisce Happy Camper snag'em stamps inked with cobalt archival ink and colorbox cateye pigment ice. The first week of the new year is almost complete, are you ready for the weekend? I know I am. If you have been following along, you might know by now that I decided to take Ali Edward's class, One Little Word. This year is going to be a year of realizing dreams, starting over, completing goals and making new ones. This year is the year to achieve one of my life long goals. I'm not say anything else - we have the whole year. Welcome friends to Workman Scraps! Is everyone gearing up for Winter CHA? Have any of you been to one? I have not but one day I vow to go. The atmosphere alone would get the creative juices flowing. Can you believe that I actually started thinking about Valentine's Day? I mentioned it to my kids and asked if they wanted me to craft a bag or project for the classroom party - all I got was a blank stare from my daughter and my son states "but it's not February yet". So much for planning ahead. Although I should just go ahead and make them so when they DO want them made the projects will all ready be done. In this layout, except for the crown (personal stash), all the products used are from Scraps of Darkness December kit - Winter's Eve. The photo is of my sister-in-law, friend and the best Aunt ever. It was taken in 1988 - and she is still as gorgeous as ever. The layout is simply but still beautiful. Today the kiddos are back in school and that means (hopefully) we can get back on our normal schedule. They were so excited about going back to school, no not to learner (LOL) but to finally see their friends. The past few days I was finally able to dig into my December kit from Scraps of Darkness. If you like Bo Bunny you will love this kit. Not only for the color but for the beautiful texture and designs Bo Bunny created with the Enchanted collection. Add in a little Scraps of Darkness flare and you have December's kit - Winter's Eve. I finally scrapped a photo of my husband and I with two of our closest friends on their wedding day from 2001. Everything about that night was magical. When I saw this kit, I knew they would be perfect together. In creating this layout, I used: sketch-Suepup, Cricut Cartridge Paper Trimmings circle page 45, EK Success Alpha stickers, Lindy's Stamp Gang Black Orchid Silver, glimmer mist candy apple red, pearl and black ranger dabbers, Ranger liquid pearls buttercup, and Winter's Eve kit. For more inspiration and a little more about Scraps of Darkness, click HERE. Welcome to day 2 of the 2012. We had a wonderful New Year's Eve and Day 1 of the new year was one of fun. Living in Texas you never know what the weather will be but the past few days have been beautiful. The kids have pretty much lived on the trampoline that Santa gave them and my husband and I have been relaxing and enjoying just being with them. This year I decided to join Ali Edwards - One Little Word. I have not settled on my word yet (I have so many). But this year is going to be huge and a lot of milestones (at least for me) WILL be met this year. No project today but I leave you with a photo.